Should You Buy DVR Shares? By the way DVR stands for differential voting rights which means that you forego your rights to vote in a company and are paid a meagre extra percentage of dividend. The DVR shares were allowed in India in 2000. This allows a company to dilute equity without a matching reduction in promoters' stake. The aim of limiting voting rights is preventing hostile takeovers by separating economic interests and voting rights. The companies that have issued DVR shares includes Tata Motors, Pantaloon Retail India, Gujarat NRE Coke and Jain Irrigation. Mark our words and never commit the folly of buying the DVR shares as extra percentage being offered in dividend is just meager whereas their is a whole lot of difference in the price of a DVR share and a normal share when market prices it. For instance, the holders of Tata Motors' DVR shares can cast one vote for every 10 shares held. However, they get 5% more dividend than ordinary shareholders. Let us see the DVR shares of Tata Motors and normal Tata Motors shares. One is shocked to see the price differential. Now do not jump to buy DVR seeing its price in 2 figures as appreciation in Tata Motors stock is going to be at a much faster rate as compared to the DVR share. Market values a normal share at a much higher rate as compared to a DVR share. So crux is that if given an option to buy DVR share or not, do not buy it and go for its parent share to get the market price appreciation. DVR shares falls first and appreciates late and thus it is better to stay away from it at all costs. Instead of trying your luck with DVR shares use our Best Intraday tip and start making money like professionals. 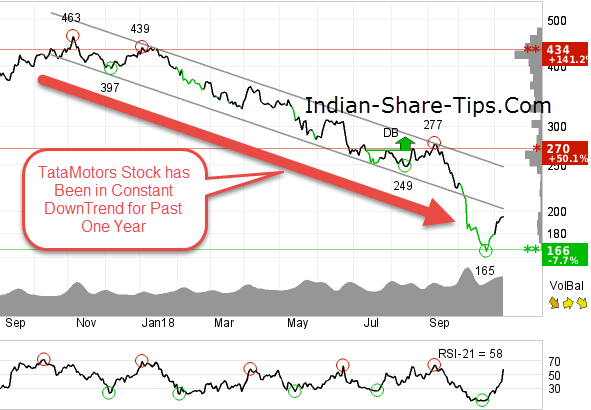 You can read more about TATAMotors DVR share here and can have a look of its weekly chart below.